When Instagram copied Snapchat's popular Stories feature in August — it's a tool that lets users share photos and videos for up to 24 hours before they disappear — Instagram execs said they did so because Stories was a format lots of other services would copy, too. "[We] built on a format that Snapchat invented," Instagram's product boss Kevin Weil explained in December. "It's a format, [and] we believe that format will be universal." On Monday, WhatsApp, which Facebook owns, became the latest Facebook property to launch a Stories feature when it unveiled a new version of its existing status update option that it's calling WhatsApp Status. Instead of posting a short status message like "out to lunch" to your profile, the new feature lets users share photos and videos in a montage format for up to 24 hours before they disappear. There are some elements that make WhatsApp's version of Stories unique — you can share GIFs to your Status, for example, and all Status updates are end-to-end encrypted, which means that once they disappear they really disappear. Videos can be 45 seconds long, not just 10 seconds like on other platforms, and Status updates are only shared with users in your address book, not followers you may not actually know. "This is a format that is being broadly adopted, and we're adopting it as well," Randall Sarafa, a product manager at WhatsApp, told Recode. "There are some pretty interesting things that we've done to make it unique to WhatsApp." 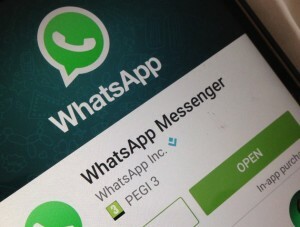 WhatsApp has historically been a bare-bones messaging experience — it offered a way to send text messages and photos in virtually any network environment, for free. The company's focus has historically been on reliability, which is why WhatsApp is popular in so many markets outside of the U.S. that are still developing network infrastructure, including emerging markets like Brazil and India. Now it's adding Status (Stories), too, a feature that feels like a more natural fit for services where users are used to sharing publicly, like Instagram. Sarafa says that WhatsApp's users share lots of media within the app, and he believes that will translate to Status as well. Those sharing totals include 3.3 billion photos and 760 million videos sent inside WhatsApp every day, twice as many photos and three times as many videos as were sent one year ago. But Sarafa reiterated that WhatsApp isn't interested in showing ads to its users, and Monday's update doesn't change that. "We're not adding ads to WhatsApp, and we don't have plans to do that," he said.